Home Crepe Blog Happy Birthday, Canada! Happy Canada Day, fellow Canucks. It’s Canada’s 146th birthday. With that, we mark one of the most important days of our heritage! Happy Birthday, Canada. With festivals, parties and BBQs adorned in red and white, how will you be celebrating this day? WIN! WIN! WIN! Here’s a contest for our Canadian friends. Send us a photo of how you spent your Canada Day for a chance to win crepes for you and 3 friends and be featured on our Facebook! Send your entries to info@crepedelicious.com or post on our facebook page. Entries must be received by July 3rd, 2013. To our neighbours to the south, we also wish them the very best as they celebrate their day, Independence Day on July 4th. Who is up for trivia? What historic event took place 44 years ago on July 20, 1969? On that day, astronaut Neil Armstrong became the first man to set foot on the Moon. Were you one of the hundreds of millions who watched the TV broadcast as the Apollo 11 crew made this historic, three-day flight? July is a historical month, but also a hot one. We mark the start of the second month of summer. The summer months come fast and leave fast, and you don’t want to let it go to waste. Make some space on the patio because it’s definitely BBQ season! According to The National Post, we’re in for a warmer summer than normal, falling into the top-10 warmest summers in Canada. We said it last month but we can’t say it enough, make sure if you’re out in the sun, you don’t forget the sunscreen. We specialize in creating world-class sweet and savory crepes. 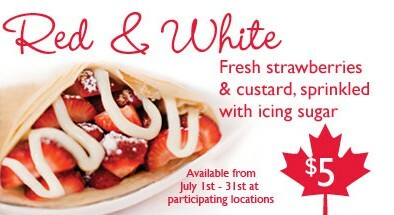 to find a Crepe Delicious location near you!